When Swedish-born Linda McGurk moved to small-town Indiana with her American husband to start a family, she quickly realized that her outdoorsy ways were not the norm. In Sweden children play outside all year round, regardless of the weather, and letting young babies nap outside in freezing temperatures is not only common - it is a practice recommended by physicians. In the US, on the other hand, she found that the playgrounds, which she had expected to find teeming with children, were mostly deserted. In preschool, children were getting drilled to learn academic skills while their Scandinavian counterparts were climbing trees, catching frogs, and learning how to compost. Worse, she realized that giving her daughters the same freedom to play outside that she had enjoyed as a child in Sweden could quickly lead to a visit by Child Protective Services. The brewing culture clash finally came to a head when McGurk was fined for letting her children play in a local creek, setting off an online firestorm when she expressed her anger and confusion on her blog. The rules and parenting philosophies of her native country and her adopted homeland were worlds apart. Struggling to fit in and to decide what was best for her children, McGurk turned to her own childhood for answers. Could the Scandinavian philosophy of "there is no such thing as bad weather, only bad clothes" be the key to better lives for her American children? And how would her children's relationships with nature change by introducing them to Scandinavian concepts like friluftsliv ("open-air living") and hygge (the coziness and the simple pleasures of home)? McGurk embarked on a six-month-long journey to Sweden to find out. 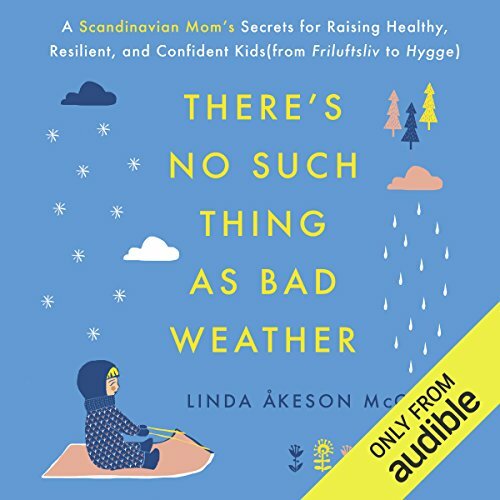 There's No Such Thing as Bad Weather is a fascinating personal narrative that highlights the importance of spending time outdoors and illustrates how the Scandinavian culture could hold the key to raising healthier, resilient, and confident children in America. ©2017 Linda Åkeson McGurk (P)2017 Audible, Inc. Highly recommend for anyone considering alternative educational methods or nature based child rearing. The author offered good information in a positive way, and was -for the most part- pretty balanced in her comparisons of various cultures. I found this book very interesting and on point with my philosophy. Some very interesting confirmations and ideas from the Scandinavian countries. I don’t completely agree with everything on the education pieces, but see the author’s point of view and how it could be beneficial. Overall a great listen and worth the time. Loved this book! It has changed my outlook on family and personal life! The story is very good with valuable lessons for everyone, with or without children. The book starts slow but gains quickly. Each chapter has a single takeaway to add to a list of actions you can take at home. the book was well written and actionable. this book has changed the way I view my role as parent. I am less worried about, well, everything. It's taught me to rise above the pressures of making sure my kids "keep up" or get an early start in their schooling, to let them play more, and most of all to trust them with more responsibilities. I'm finding opportunities everywhere to get my kids outdoors more. some other moms in my area read this and organized an all weather nature playgroup that has already attracted many local families. it is my sincere hope that all parents will read this. Together with Richard Louv’s books, this book provides the important guidance and personal experience in how to enrich a child’s life with nature. The title of the book is kind of the whole book. (Spoiler alert) There’s no such thing as bad weather; just bad clothes. There’s also some comparative commentary about how the outside is taught to children in the US vs Scandinavia. Good information: sure— but coming from Mississippi or Nevada or any state where it’s not quite Scandanivia-esque, well there are other considerations. Good repetition on how integrating childcare and outdoors is not as scary a practice as it’s made to be. Starts off a little preachy, but if you stick with it, it’s pretty interesting. Overall worth listening to. Loved this story! It’s refreshing to hear someone call out the helicopter parents. It’s truly no wonder that kids have self-confidence issues because parents have an incredible drive to make sure their kids “get it right”. We have become way too competitive and our kids are suffering for it. Much better to let kids explore and play, especially outdoors. My objection to the content is the preachiness of climate change. No matter how much you want to believe that humans are parasites to the planet, the science just isn’t there. It just rubbed me the wrong way. That was only a small part of the story, though. I thoroughly enjoyed the rest. As a Preschool Teacher being torn to conform to today's version of early ed teaching practices, this book encourages me to not lose sight of my beliefs to let children learn, observe, and explore in nature. The Author has provided great examples of personal experiences and researched facts showing the benefits of children being outdoors. It inspires me to be "the person" in our community to remind parents that our children do not need more screen time, they need to spend more time outdoors! I would recommend this book to all parents of young children and educators.